"Homelessness is something you can't really miss in San Francisco," the 51-year-old former marketing executive told ABC News. "One day I passed a woman in the street and she was very dirty and basically crying, and I heard her say that she would never be clean. There's obviously a lot of layers to that but I was wondering what her opportunities were to actually get clean," Sandoval said. "His name was Mr. Earl and he was a Vietnam vet - a lovely man. At the time I would walk my daughter and he'd stop and chat with us. About two years ago he was evicted and ended up on the street. The last time we saw him was about six months ago. He was just in really bad shape," she said. "We just realized that this shouldn't be happening. These are human beings." One of Lava Mae's biggest supporters is Bevan Dufty, the director of Housing Opportunity, Partnerships & Engagement under the mayor of San Francisco. "For people who are unhoused, access to showers is very difficult. Shower buses are something that could potentially be deployed in response to an emergency, so it is relevant to all San Franciscans," Dufty said. "Doniece has done an incredible job as a citizen who cares about helping the poor. We are very excited to see Lava Mae become real next year." Each bus will have two shower stations and Sandoval expects that by 2015, they'll be able to provide 2000 showers a week. The project is currently $80,000 short of its first year's budget of $365,000 and is run on donations. 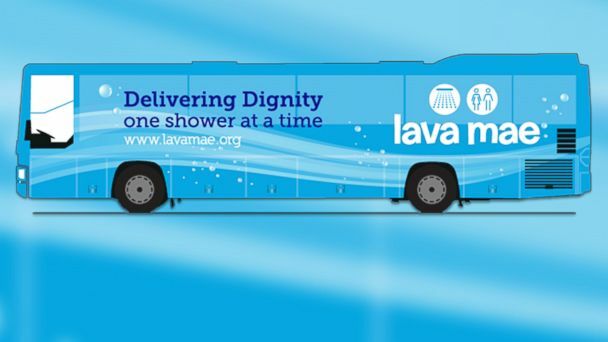 Lava Mae has a fiscal sponsorship through the nonprofit ZERO 1, The Art and Technology Network, but hopes to apply for its own nonprofit status next year.